Turns out, though, it was a rainbow. 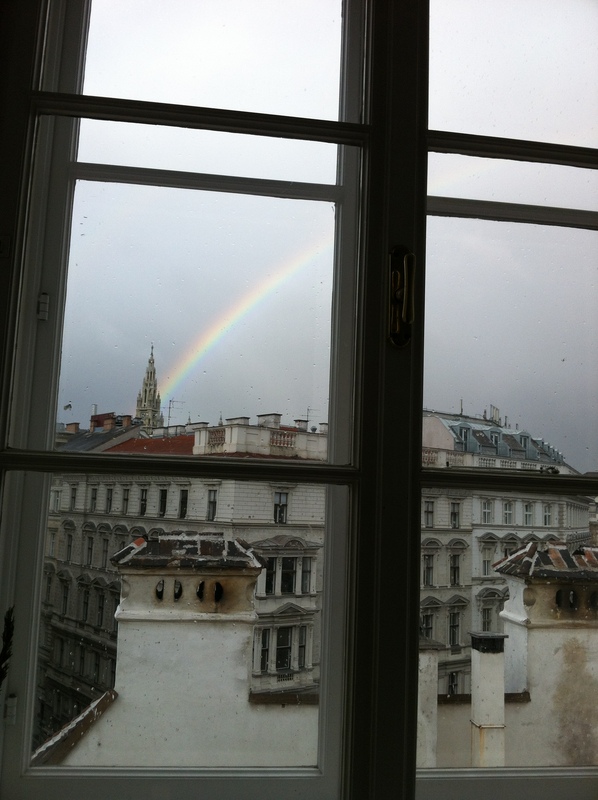 A clear, bright, vivid rainbow — the most distinct I’ve ever seen, arcing across the sky and ending right behind our view of the Rathaus (I guess that’s where the pot of gold was hidden). I ran to get B to show him, and we oohed and aahed and took a bunch of pictures. A great start to the day! After taking B to school (we were a bit late, partly thanks to a train that broke down — at a station, luckily — which had to be backed out of the station in order to make way for the following train) we joined Dan for coffee, came home, hung out, had lunch and I tried to get the kids down for their nap (1 of 2 isn’t too bad — Liam slept for 13 minutes). Although it rained on and off all day (and even sleeted very briefly this morning) and we are all in various stages of exhaustion (not just from the extra excitement of having Mina visit, but just from life) we wanted to get out a bit. 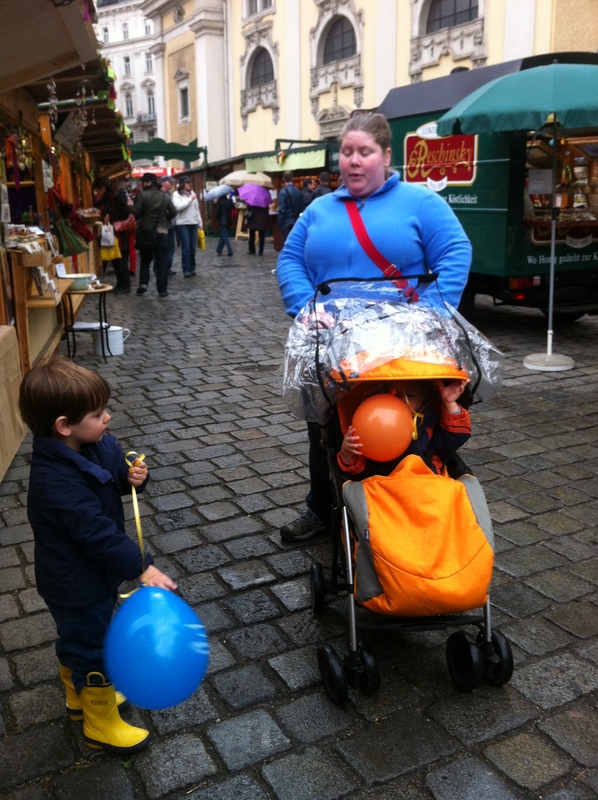 So, we bundled up the boys and headed back over to the closest Easter market. We bought cupcakes and visited the bunnies, who, due to the low turnout at the market, or perhaps the gloomy weather (do bunnies prefer gloomy weather?) were more active and social than before. 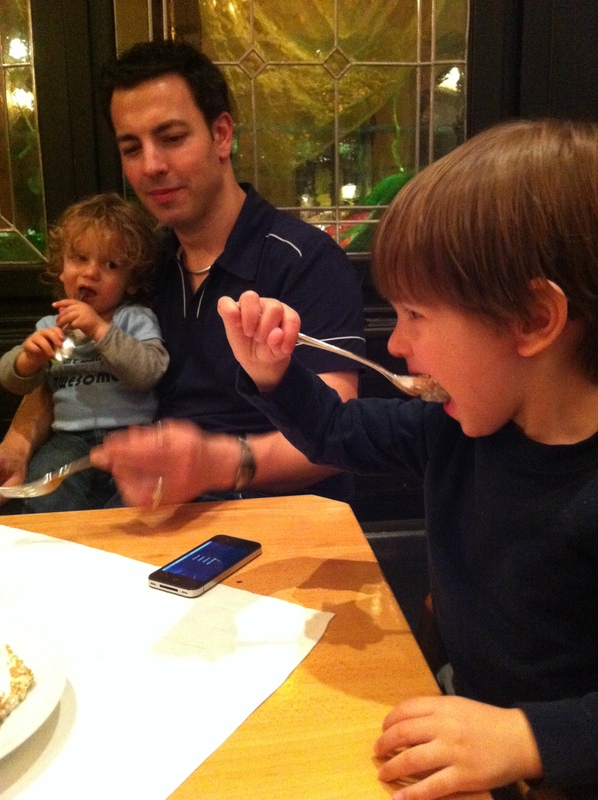 Then, balloons in hand, we met up with Dan, and went to dinner where we enthusiastically (and yummily) introduced Mina to traditional Austrian food, completely with an ending of apricot-filled scoops of ice cream. Now we’re home and it’s time to prepare for movie night. It rained, we’re tired, Liam didn’t take a nap. But we saw an amazing rainbow, got free balloons, visited the bunnies and had an amazing dinner. My boys are sweet, cute and wonderful, and Mina is here. Life is wonderful. This entry was posted on Friday, March 30th, 2012 at 6:20 pm	and is filed under Adventure in Vienna, Baby, Em's blog. You can follow any responses to this entry through the RSS 2.0 feed. Responses are currently closed, but you can trackback from your own site.